This is one of the quickest and easiest starters you could ever make. Better still, you can make it a couple of days ahead – just keep it covered in the fridge. (Don’t freeze it.) It’s delicious, looks good too, and it takes less than ten minutes to make (plus chilling time). Bung it all in to the food processor and blitz until it’s smooth. Spoon into a serving dish or dishes. Refrigerate until firm. Serve with Melba toast or brown bread – or oatcakes, as I’ve done here. 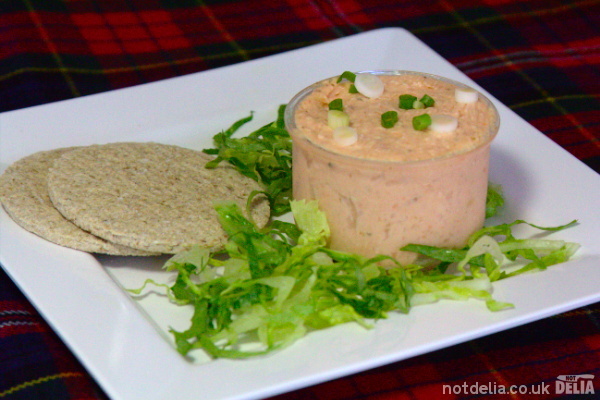 You can also spread the paté on top of Ritz biscuits or similar to hand round as a party snack.